Le Marche is a beautiful region full of breathtaking hills and mountains. The coast is nice and warm, with sandy beaches. Fano, a Roman colony, today a small seaside resort and fishing port and also Pesaro is on the coast, and with its seaside resort and good seafood restaurants attracts many tourists. The beautiful Renaissance palace and its famous opera festival Rossini in August are well-known. 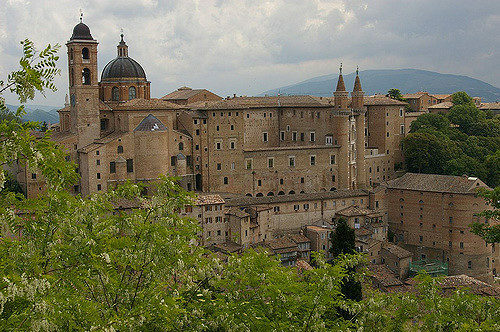 The jewel on this part of Le Marche is Urbino, the perfect town of Renaissance. The birthplace of the painter Raphael, whose house can be visited, Urbino’s fine historic centre is a UNESCO World Heritage Site! Here you can visit the National Gallery of the Marche with one of the best Renaissance art collections in Italy. Astonishing for its beauty is also the Ducal Palace. The botanical garden and the archaeology museum will complete your trip. Urbino organises a festival of ancient music in July and a Jazz Musical events in the astonishing Fortezza, where students and visitors usually go to rest. There is a very good Italian summer school with courses held directly by University of Urbino. Urbania is a very attractive town located in a lovely setting on the Metauro River and very close to Urbino. Urbania owns an imposing Ducal Palace, which is a 13th century fortress. A good museum with paintings, ancient maps and globes, and ceramics are in downtown and if you go in this area of Le Marche during Halloween, pay a visit in the Chiesa dei Morti (the church of dead) where there is a small display of mummies. For the opera fans, here the Italian Operatic Experience runs a summer programme for young opera students and then presents opera performances at the end of the season. Not too far you can find the Sibillini National Park is in the Sibillini mountains in the southwest and worthy to visit. This entry was posted on Monday, October 29th, 2012 at 7:34 pm	and is filed under Events in Italy. You can follow any responses to this entry through the RSS 2.0 feed. You can leave a response, or trackback from your own site.